Yesterday’s papers led with a picture of cricketer Ankeet Chavan and his wife Neha shot at their wedding on Sunday. Ankeet has been in the news for all the wrong reasons. One of the players arrested on charges of spot-fixing in the IPL (Indian Premier League) scandal, Ankeet was granted bail until June 6th by a Delhi court to enable him to get married. The marriage itself, per earlier, erroneous and speculative, media reports, was doubtful. Until, of course, the bride-to-be, Neha Sambri, came out and clarified that no matter what, she stood by Ankeet and was going ahead with the wedding. In the midst of all the scandals, rumors, controversy, it’s remarkable how the Chavan and Sambri families decided to face the reality stoically even as they went ahead with the wedding as planned. Perhaps Ankeet is indeed guilty and may be convicted. But, either way, his cricketing career is all but over with Rajasthan Royals (the franchise that he was part of) sacking him and the BCCI (Board for Control of Cricket in India) banning him from the game pending a probe. 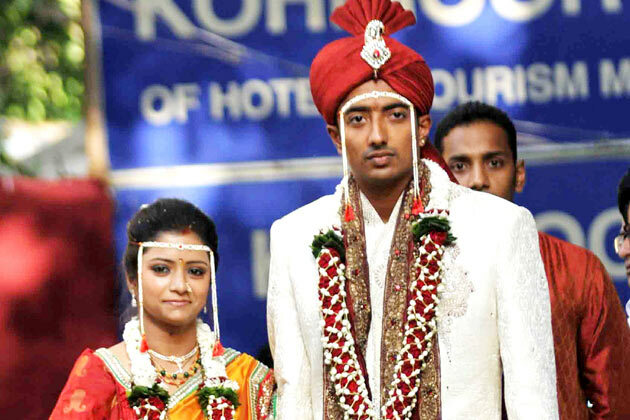 Yet, there’s something beautiful about Ankeet, his family and his long-time girlfriend and now wife, Neha. And it is that they have displayed rare courage to face Life squarely and to move on. You will agree this isn’t easy. I remember when I was Ankeet’s age a project I was involved with went bust. And I was rendered jobless and people in my professional network looked at me suspiciously. Many of them dubbed me a failure. I was so stung by their remarks that I refused to even come out of my bedroom. I was scared to face the world. I was hiding from Life. In that context, Ankeet and Neha have show tremendous grit. They teach us that clinging on to something that has happened, a past which cannot be undone, is an exercise in futility. The past is a chapter which is over. We have lived through it. And perhaps learned from it too. What’s the point then in allowing ourselves to be tormented and enslaved by it? Whether the past happened of your own accord or happened beyond your control, even if you thought you were right doing what you did then, even if all of it blew up on your face, isn’t it sensible to simply move on? To love the present and to keep loving it? The other learning from Neha’s decision is that actions are not half as important as intent is. If your intent is right, and conscience clear, it’s perfectly fine even if your actions are questionable because of the circumstances and context in which they took place. Also let’s remember that nobody is a Saint. In fact, even a Saint may well have a sinful past and no Sinner is beyond reformation. Journey through Life with this complete awareness. Know that there’s no one way to live Life. That each path has its own challenges, opportunities and tragedies. Nothing is permanent. A fall hurts. But, again, no fall is permanent. When you fall, get up, dust yourself and move on. Life cannot be lived fully when in grief. Life’s a celebration! It requires a total understanding – that you will make mistakes, you will be a victim of your own designs or of circumstances, you will fall __ but each time, celebrate the learning in each experience and simply keep moving on!